Below are snippets taken from a conversation between Amy Fung and Rita McKeough on May 26, 2010, at the Art Gallery of Alberta. McKeough's piece, "Wilderment", premieres on May 29 at the AGA as part of The 2010 Alberta Biennial of Contemporary Art: Timeland. Speaking to the idea of time running out, McKeough takes a 10 minute breather from her laborious installation to speak about her new work. Also: the new third floor terrace cafe proved to be extra noisy, so excuse the excessive clanging! Timeland marks the first edition in the Alberta Biennial of Contemporary Art’s short 14 year history where it has been curated from a perspective external to the host institutions, and notably, external to the province. Inviting Richard Rhodes, Editor of Canadian Art magazine and an independent curator for over twenty years, the Art Gallery of Alberta and sole host of this year’s exhibition appears to be making a bold statement. Shifting dramatically into the 21st century with not just a new building, but with inviting a reputable outside eye to fulfill the premise of “showing Alberta art to Albertans”, the AGA is opening up a largely localized debate onto a national and international playing field. The result will open on May 29 to the general public, but at first glance, the released line up of 24 artists breaks down to be predominantly male, white, residing in Southern Alberta, and already enjoying some level of success outside of the province. While the selection process remains to be culled from an open call that is then whittled down to studio visits and a final list, this year’s line up holds an air of anticipation regardless of familiar names. The context has shifted, and that becomes clear when you speak to an established artist such as Lyndal Osborne, who will be making her third appearance out of seven biennials. In 1996, the then Edmonton Art Gallery was shifting from its modernist ties to a broader contemporary field, engaging in the model of a biennial to provoke new discussions on the state of art in Alberta. 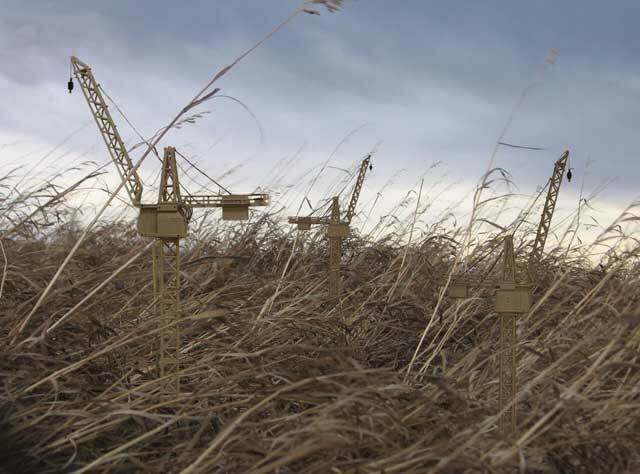 While over ten years has passed since that model was first adopted with the exhibition touring to at least two different institutions within the province, the show will only appear at the Art Gallery of Alberta, but there is hope that the show and the building will become a destination point this summer. Image credit: Chris Millar, Bejewelled Double Festooned Plus Skull For Girls, 2009, Acrylic Paint, Styrene, ABS, Metal. Collection of The National Gallery of Art. Image courtesy of the artist. 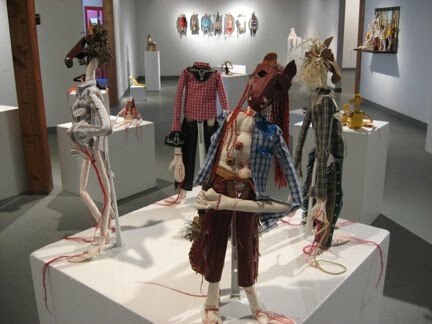 While issues of exposure and support may reveal more about the differences between Edmonton and Calgary’s art audiences, galleries, and collectors, there is a lingering and volatile notion of the biennial being an inclusive project, serving to only propagate the commercially successful components of Albertan art. Another recent addition to the province within the biennial is Kristin Ivey, who drove to Alberta’s most southern westerly region of the Crowsnest Pass from Halifax for a residency in 2008--and has never looked back. Enchanted by the mountainous terrain of the region and the tragic beauty of the town’s history, which is actually five small towns about two and half hours south of Calgary, Ivey has been living and working mostly in isolation in a population of roughly 6,000. “I only know two of the other artists in the biennial, Rita McKeough who taught me at NSCAD, and Wednesday Lupypciw, who did the residency at Thomas Gushul’s right after me,” says Ivey, who has also never been to nor shown in Edmonton. Working in reclaimed fabrics that began in Halifax and has since grown to over 200 ft in length, Ivey has settled down in the area, buying a house, and relating to the land in a way that is akin to a burgeoning romance. Idealizing Crowsnest Pass for the first two years, Ivey feels she is now seeing things more clearly, but remains enchanted with an idea of this land as being from another time--a theme within this year’s curatorial approach. Having recent exhibitions in Calgary, London, Ontario, and Toronto, and an exhibition in Nova Scotia later this year, all since graduating in 2007, Ivey has found her corner of the world that fuels and inspires her, living in awe of a place she can’t help but call home. And like Ivey, the AGA looks to break its own isolation by engaging in a larger dialogue, seeking support from outside sources, as often the case, the recognition we seek exists beyond our local spheres. Known for its undulating coulees and its untempered gusts of wind, Lethbridge is also home to one of the most intriguing art scenes in Canada. While the specter of international art stars Janet Cardiff and George Bures Miller lingers around the reputation of the town, retrospectively, it could be worthy to view the new media scene in Lethbridge as an instigator for what would be important contributions in Canadian contemporary art. Embedded within the valley as if it the concrete were slabs of natural bedrock, The University of Lethbridge plays a major factor in generating and maintaining the city’s reputation in contemporary art. Employing the majority of working artists in the city in some capacity or another, housing one of the best collections in Western Canada, actively producing quality publications on their programming, giving public space to curated exhibitions from the collection throughout the year, hosting touring shows in a similar capacity of an artist run center, U Leth has been dedicated to its Liberal Arts education from the beginning, with the Liberal Arts building being the second building built on campus. All of it is of course also designed by the one and only Arthur Erikson, who designed the Fine Arts building around Sorel Etrog’s Moses sculpture, which in the year the University opened, was featured at Expo 67 In Montreal and remains a source of pride as the first donation in a 13,000 + collection that only continues to grow. 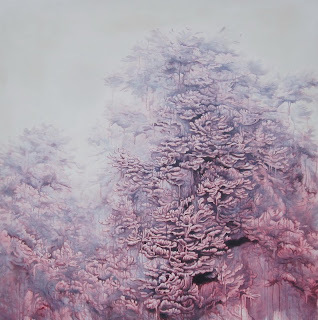 Currently up within the University of Lethbridge Gallery was an exhibition, “In the Stillness,” internally curated by Jane Edmundson, sourcing works from Tony Urquhart to Murieal Castianis to Robert Rauschenberg that take up Michael Fried’s essay, “Art and Objecthood”. While on paper it appears there is a strong focus on 60’s and 70’s examples concepts of theory, this exhibition is a fine example of how to work from an established legacy and expand upon its merits to engage in contemporary practices. Headed by Josephine Mills who has pushed the institution into a centre for investigating collections as well as using collecting as a working method, the University of Lethbridge Gallery ranks as one of the top three art galleries in Canada on par with Carleton and Justina M Barnicke. Not to say that there is no arts community outside of the University, as within 24 hours of arrival, I took in the temporary home of the Southern Alberta Art Gallery and spent a lengthy duration of time at the Trianon Gallery for Maria Madacky’s solo exhibition, met the keepers of the ongoing and elusive Potemkin Society, visited the haunted Bowman Arts Center, had a tour of the seedy social world of Burning Ground Studios, and completed four individual studio visits. One of the studio visits was with Mary-Anne McTrowe, who along with Daniel Wong, make up the inexplicable music duo The Cedar Tavern Singers aka Les Phonorealistes. Singing catchy folk art pop ditties, the two are also Sobey Award Finalists this year, and who along with photographer David Miller, will be the unofficial Lethbridge contingent in this year’s Alberta Biennial: Timeland, opening this weekend at the Art Gallery of Alberta. Serving Edmonton’s visual arts community for 25 years, the staff of the Paint Spot are receiving a retrospective “Silver Alumni” exhibition spanning past and present employees. As the first staff exhibition in their new location just south of Whyte Avenue (10032 81 Avenue), there have also been changes to the gallery, renaming it from the Fringe Gallery to the Naess Gallery after Paint Spot cofounder and gallery curator Sidsel Naess Bradley. The gallery size has also shrunk considerably, but the trade off is that the space moves front and center into the entrance way with natural light and far more exposure. While this is only the first show I’ve seen in the new space, I preferred the solitude of the old gallery space and its configuration, as this new space with one dominant wall will have to do more with less. But that’s not the case for this show. Showing close to forty artists from across Canada, the exhibition wraps around the Naess Gallery and above the retail floor and back to the workshop space on walls designated as the Salon Gallery, Vertical Space, and Artisan nook. New works by names new and old pop up by artists that have no other connection to each other than where they all once worked. With a concentration still within the Edmonton region, all of the Paint Spot’s staff are artists themselves, and many still keep ties whether as workshop instructors, fill-ins, and of course as customers. The problem then is that the show does not flow and has a challenging task of mixing various artistic levels and interests, and it would have been more interesting to show works that spanned 25 years rather than getting all new works, but the most positive aspect is the connection many of the staff still have to the store. With the big move came an extra 2000 sq. ft of space, most of that obvious on the much larger and expansive retail floor, and it is clear the move off of the hustle and bustle of Whyte Avenue has actually been quite positive. Having twice as much shelf space, the store is now able to display the full range of sizes and colours of their products. Gone are the cramped aisles and low ceiling and the densely packed shelves of nibs and tints. Humming along after the formidable move of their displays and inventory, the Paint Spot remains the main organizer of Whyte Avenue’s Art Walk coming up in July, which will be the largest yet as the artists set up across the tracks and an emphasis is given back to originals by fine artists. Living in oil country, we sometimes lose awareness of how this industry affects all areas of our lives. From its ongoing impact to our quality of life in terms of economy and environment, the value we have given oil also dictates the speed at which our society develops. Taking on these contemporary issues for intellectual pursuit, the University of Alberta offers an annual course on Oil and Community through their Community Service-Learning Program (CSL), investigating how oil affects issues such as gender to this year's topic of art. Dr Joanne Muzak, who will be leading the six-week spring-session course, refers broadly to the term, "creative responses" in addressing the spectrum of approaches and topics outlined in the course syllabus. Days before the class begins, she shares over the phone, "I'm interested in questioning what constitutes a creative response, from artists using the law creatively, or The Discovery Channel's proposal for a license to drill, or interrogating actions like members of Greenpeace climbing onto drill towers and calling into question if that's a form of performance art or what the outcome of this stunt could mean." Interested in questioning the role of pop culture as well as the cultural value of artistic representations, Muzak points to the upcoming "Oil" exhibition by Canadian photographer Edward Burtynsky as an example that defies easy categorization, "[Burtynsky] for example doesn't consider himself an environmentalist in works that show the scale of the tar sands. They are so beautiful, so abstract, you don't know what you're looking at anymore." To compliment these themes of the politics of esthetics, the course will play host to a series of free artist talks, open to the public, that begin on the evening of Thursday, May 13 (ironically on campus in the new Natural Resources Engineering Building). While the first talk will focus on the politics and representation of oil and art, the last talk on June 10 will be by Peter von Tiesenhausen, an acclaimed visual artist who unprecedentedly copyrighted sections of his ranch in northern Alberta as a work of art in an ongoing battle with the oil and gas companies. Being a CSL course, the highlight for most students will be completing their placements, emphasizing a hands-on learning experience in working directly with community organizations. Choosing from options—such as helping to organize iHuman's Urban Games, setting up WORKUS' mobile installation on stories collecting occupational illness, to working with the Friends of the Lubicon on aboriginal land claims, producing shows for CJSR's Terra Informa, to even serving as tour guides for the Art Gallery of Alberta's upcoming biennial—the course is designed to challenge students beyond the theoretical classroom discussions. "An important element of CSL is to work with the community," continues Muzak, who acknowledges that the issue of oil goes beyond just addressing the surface politics of oil and art. "Hopefully we're providing models for the students to think through how art functions in constructing and building community and the broader politics of art." In naming a modernist painting exhibition Retro-Active, there is a false predisposition in framing the come-and-gone flat structural aesthetic of modernism as a style that has returned as fashionable. Only in reading curator Peter Hide's exhibition essay, his use of "retro" is curious, if not confused. He writes, "Retro is of course a fashionable word for art that looks back to a previous time." Retro, rather, is a word for art that looks back to a previous time made fashionable. He goes on to describe postmodernism as weak and insecure in its approach to looking back, and in doing so, Hide presents such an entrapped sense of logic that there is no room for debate, an ongoing condition with modernists who only feel nostalgia and entitlement to uphold their lineage in Western art history. I hark on the misuse of "retro" as, after attending the artist talks by Mitchel Smith and Sheila Luck, I am genuinely flabbergasted, and slightly appalled, that this completely outdated mode of art is not only still being made and sold in contemporary galleries and showing in artist-run centers, but is being self-aggrandized as the only "serious" art still being made in our time. While lamenting how nobody understands the usefulness of abstract art in one breath and then calling down the contemporary art of today, there is a cycle of deep denial and hypocrisy at play. Referring to modernist works specifically, Smith stated that amongst the trivial art being sold today, the need for serious art is more important than ever, and that institutions and collectors, especially the AGA, don't support serious art like they used to. Well, that to me is a clear indicator: if the appetite and demand for modernist works has significantly shifted down, then the supply and production of modernism needs to keep on par with its demand. Mark Rothkos and Barnett Newmans fetch millions and command respect because they remain tied to their context in history, which cannot be resummoned due to an aesthetic similarity. Because outside of all this, Smith and Luck are actually creating visually pleasing works that are unfortunately attached to a cache of encapsulated glory. The central issue overshadowed here is that the individual works of Luck and Smith are rather good. They are good not because they remind Hide of Robert Motherwell or Ken Noland, but because they demonstrate a clear, if not dedicated voice. They are consistent in form and expression, perhaps Smith more so than Luck. 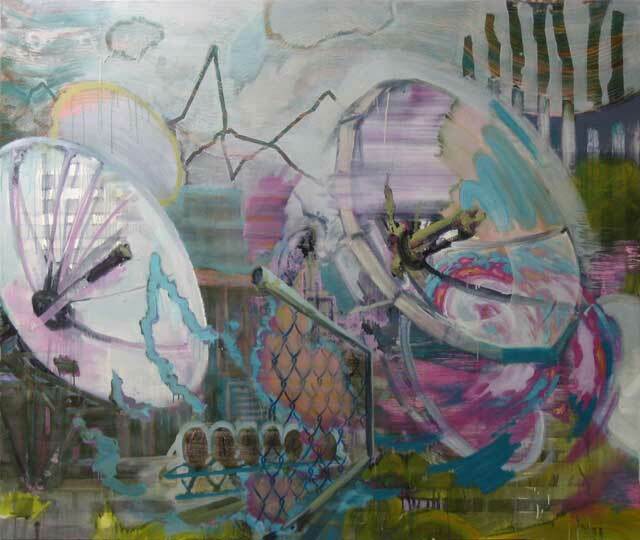 Luck is the more exploratory, if not more talented painter of the two, harnessing an imbalanced emotional depth in pieces like the sublime "Harvest" and the poorly titled "Tilt-a-Whirl." 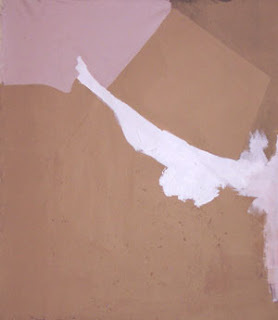 I hasten to even connect Luck to lesser-appreciated abstract expressionist painters like Helen Frankenthaler, who may be one of the greatest painters of the 20th century, but lives on in the shadow of her husband Motherwell. She and others like Nancy Holt lived in the shadows of their partners and contemporaries because women were not considered serious artists, and those receiving any due were often given the recognition that they painted like a man. It is this proliferation of self-important discrimination that has pushed modernism from an important and interesting era into the dark ages. There is no right to dismiss all other forms of art as non-serious endeavors, no possible logic to think modernist works are more serious than works by contemporaries like painter Julie Mehretu or artist Urs Fischer. The hallmarks of good art can be judged by their increasing value in culture and society over time. The Rothkos and Newmans will continue to stand because they are emblematic of a unique postwar aesthetic movement that involved a cross-pollination of influences specific to a certain time and place. To continue making this style of work, and to be taken seriously, Luck and Smith need to not lean on the specter of modernist ideals, and instead connect their art directly to the living world, because it's only there where it exists and communicates. Since receiving the generous acquisitions of largely decorative silk textiles from Edmonton-based Sandy and Cécile MacTaggart in 2005, the University of Alberta's Museums and Collections has been proudly proclaiming its world-class status as the only museum in North America that houses original Chinese Imperial court dress folios and their corresponding examples of elaborately coded garments. As the MacTaggart Collection does not have a permanent public display or a curator, last week the U of A released a hefty 300-plus-page full-colour book on selections from the collection. 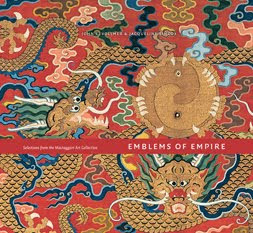 Delving into an ancient civilization of impeccable social order and a history that cannot be contained in one book, Emblems of Empire falls heavily on the tone of the text, setting up the context for the patterns, colours and lusters that the MacTaggarts have spent 40 years collecting. Written as a survey into the history of ancient China, authors John E Vollmer and Jacqueline Simcox span back over 5000 years from the beginning of sericulture (the farming of silk) to understanding the court, palace life and the Imperials' understanding of universal order. Looking at early Chinese civilization and the importance of silk to the culture, the primary focus of the book lies on the structure of the Imperial court with very little insight into the political development of the country. This is a considerable gap, as the Qing Dynasty (the last imperial dynasty in China) fashioned their styles based on the utilitarian use of the Manchu people, who, after successfully invading and defeating the Ming Empire, enforced dress regulations to differentiate between the variation of ethnicities in China. Spending most of the book explaining the world of Imperial China is a massive task, yet the authors—much like the courts they describe—appear only interested in projecting and upholding an image of prestige and order, offering insight into the everyday. While at a glance the robes are certainly luxurious in appearance, every single one was a commissioned work produced by teams of designers, technicians and artisans working for the Imperial factories. The robes served as highly decorative uniforms, following ceremonial dress regulations that focused on the role of the Imperials during festivities like lunar and solar rituals. While this is all interesting within the book and collection, it goes without saying that we are discussing artifacts and not art, as the two terms are still being used synonymously for each other in regards to this collection. As artifacts, the clothes can educate viewers about the last two dynasties of China's Imperial history, with the Ming Dynasty dating back to the 14th century and the Qing leading right up to 1912. But as China has rapidly modernized over the past several decades and assumed its current position as a global superpower, it would be ethnographically insensitive to classify these robes as art, as they hold very little connection to contemporary Chinese culture. In many ways, this collection holds onto a past civilization that has been destroyed for the new, putting truth to the notion that one person's trash is another person's treasure. In Cécile MacTaggart's introduction, she fondly remembers her early collecting days in London, where dealers would simply bid on the silk robes for their gold buttons, cutting them off right then and there and discarding the robes themselves. In earnest, she and husband Sandy collected their first 18 robes this way, beginning their love for collecting with these illustrative histories and now sharing their passion in a new era. Almost appearing as if the entire senior printmaking class had packed up and moved its studios from FAB to the studios-in-the-making at SNAP, the first exhibition inside of the new street-front Jasper Avenue studio offers the public a first glimpse of the working studio inside of the newly located SNAP Gallery just off of 121 street. With a gallery that just opened in March and a 4000 square foot communal studio around the corner on the ave, the new space not only offers nine individual studio spaces for rent, but gives working artists in this city a much-needed dark room. Livening up the new SNAP location with a vast array of work that takes up both wall and floor space, In Between Surfaces seems the ideal inaugural show to kick things off. Featuring the senior undergrads in printmaking and the first-year print graduates working and honing a variety of styles, the exhibition as a whole also echoes the transition from an academic world to the real one. Demonstrating a sense of ownership and pride in sweeping the studio gallery last week as I randomly popped in, Mindy Heins, a new BFA in printmaking doubling as gallery attendant for the day, is exemplary of the attitude fostering inside of SNAP. Originally hailing from Eagleshaw, just north of Grande Prairie and not quite to Peace River, Heins actually came to the U of A enrolled in the faculty of science. Being exposed to a fundamentals in art class—and art making in general—Heins eventually transferred in her third year and she hasn't looked back. "It goes without saying that art works a different part of your brain," she says, who favored chemistry in her general science studies, but with the encouragement of her mom, switched over to the fine arts. 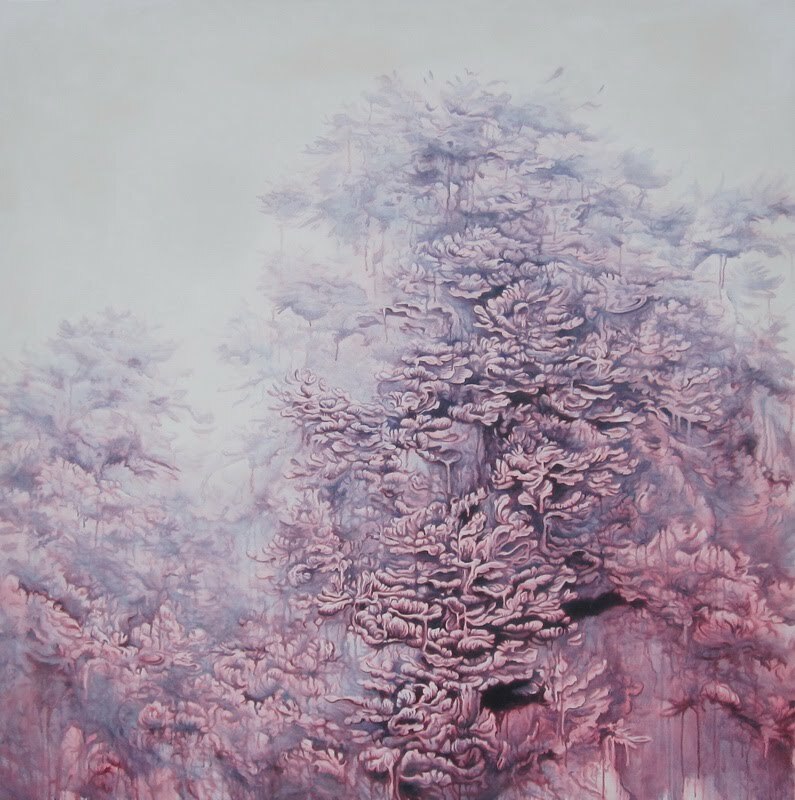 With an aptitude for the alchemic principles of printmaking and understanding basic analytical logic, Heins at the end of her BSc-turned-BFA remains rather excited about the endless possibilities in art, sharing, "You can always learn more in art making, and the results will always vary due to the subjective nature of art." Heins, along with fellow classmates Kelsey Stephensen, Colin Lyons, Jackie Wan and Camille Louis—to name a few amongst a strong graduating class—now get a well-deserved break, but looking to their professors and peers in Edmonton's vibrant printmaking community, these aspiring artists have a firm grip on the realities of becoming a professional. "I see the interesting frontiers from my peers heading off to residencies around the world, and having our professors being international in scope does open up doors," Heins offers. 'They can point you off to a residency in Belgium or suggest a great wood cutting workshop in Osaka and help you build international exchanges. Seeing how they're internationally active and locally based, I see how being an artist is tangible." Just over six years ago, SNAP was operating out of the Great West Saddlery Building on 104 Street, facing a major move in its 22-year history. Having a six-year stint next to the failed arts hub of The Red Strap Market up until just this past winter, SNAP under the new helm of a new generation of passionate printmakers appears to be taking back the reigns of a tried-and-true artist-run culture. Artists include: Tim Grieco, Mindy Heins, Mariya Karpenko, Jennifer Konanz, Camille Louis, Lisa Matthias, April McKenzie, Emery Lane Norton, Lisa Rezansoff, Kelsey Stephenson, Alexander Stewart, Katherine Vos, Jacki Wan, Dawn Fenton, & Graduate Students: Anna Gaby-Trotz, Jill Ho-You, Colin Lyons, Alexa Mietz. Edmonton artist and arts administrator, Blair Brennan, examines the new Art Gallery of Alberta and its relationship with local artists. A recent Edmonton Journal article about newcomers to Edmonton, suggests that a visual arts community can “act as a surrogate family”. It is clear that this is meant as a positive attribute. I admit that the arts community is family–like but it is often a dysfunctional family overrun with petty jealousies, professional rivalry and deep resentment. It is a complex dynamic but Gore Vidal’s aphorism “Every time a friend succeeds, I die a little” goes a long way to explaining the situation. Jealousy and insecurity are built into the creative life of many visual artists and major arts events, like the recent festivities surrounding the grand opening of the new Art Gallery of Alberta (AGA), can bring out the worst in our large, odd extended family. I have no concrete evidence, just an awareness based on experience and somewhat verified by post-opening conversations, that local artists are anxious about their place in the new regime. Apprehensive artists may rightly see the new AGA as a symbol of the changing position of the art gallery and museum in our culture. It has been a long trajectory (some would call it a descent) and much was altered when Thomas Hoving, Director of New York’s Metropolitan Museum of Art (the Met) from 1967 to 1977, invented the museum blockbuster – large, popular, expensive exhibitions with aggressive marketing and museum gift shop tie-ins and product sales that often paid for the shows. In his book Making the Mummies Dance, Hoving tells us that he demanded that the Met curators provide shows that possessed “both a scholarly basis and a public appeal, something profound and something box office.” This philosophy may have allowed contemporary galleries and museums to compete for viewers and update an image that, again to quote Hoving on the Met, was “elitist, stiff, gray and slightly moribund”. Hoving’s legacy is, however, not entirely positive. Even the least sceptical viewer would be forced to acknowledge that the Met’s blockbuster shows helped paved the way for the new featured display in Washington D.C.’s National Museum of Crime & Punishment -- the 1968 Volkswagen Beetle once owned by infamous serial killer Ted Bundy, “the car into which he lured his victims and in which he killed many of them…” (as recently reported by the Washington Post). Name change – Change the name from the Edmonton Art Gallery to the Art Gallery of Alberta. The name change affirms the AGA’s position as, not just a “centre of excellence for the visual arts” but rather, Alberta’s and Western Canada’s premiere centre for the visual arts. With this seemingly simple change, no other public art gallery in the region can touch the AGA for prestige and credibility – not the small artist run centres, not institutionally affiliated galleries and not the larger public galleries in Calgary, perhaps the biggest competition in this area. New building – Create interest in an architectural competition; generate more media attention with the announcement of the competition winner; and, perhaps the most difficult part, sustain public interest throughout the building process. Gala opening(s) and a period of free public access – Invite your friends and supporters to see the new digs, once construction is complete. Invite the public but give them only a taste. Make the membership price reasonable and close to the cost of three or four visits. Make public access for this grand opening period free but for a limited time. It doesn’t matter if this limitation is a sham. All hype is manufactured and nothing makes PR people salivate like the words “supplies are limited”. “You CAN please everybody” exhibition programming – Make inaugural shows diverse and crowd pleasing. If you like pretty pastel pictures of ballerinas in gold leaf frames, they’ve got Degas. If you like photographs of famous people, they’ve got Karsh. If you think it is important to create relationships with nationally important fellow institutions, they’ve got Goya from the National Gallery. If you like avant-garde work that incorporates new technologies and bridges the gap between audio and visual with a strong sense of narrative tension, they’ve got Janet Cardiff and George Bures Miller. Promotion – Do NOT let any of the above go unnoticed by the press. This is the most important feature, second only to finding the money for all of this. Every new development and small success (especially those involving corporate partners) must be covered by the press. This will include articles by various reviewers and columnists, television coverage, pieces in national arts press, cover stories in local arts magazines, etc. You need as much media as possible or nothing else matters. With so much done by the book (though it seems like a book written by Hoving or another museum or art gallery public relations expert) it seems almost pedestrian to mention the lack of local artists in the inaugural exhibition programming. In response, AGA staff would, no doubt, point to Janet Cardiff’s and George Bures Miller’s tenuous connection to the city and province (both attended the University of Alberta and, before becoming international art stars, lived and worked briefly in Edmonton and then Lethbridge). The AGA might also point to “TIMELAND”, the upcoming 2010 Alberta Biennial of Contemporary Art, as a conspicuously Alberta-centric exhibition. Much about the AGA’s relationship with local artists will be revealed with upcoming exhibition programming. However, token inclusion will not dispel Alberta artists’ collective anxiety attack. This is merely a small part of a bigger issue. Like the institutions that show their work, contemporary artists struggle with relevance to a larger community and commitment to aesthetic ideals – their own version of “box office” versus “profound”. If jealousy and insecurity are the result of competition, the new AGA is a reminder to artists that, at least with regard to “box office”, competition has grown exponentially. The highest priority for the AGA is getting people through the door. This challenge is intensified because the AGA struggles with a legacy of irrelevance to the larger community. An expensive and distinctive new building, combined with please-everyone exhibition programming, is a brash announcement that the AGA is the place to go -- a sound investment for the public’s entertainment dollars in the same league as the Winspear Centre, the Tyrell Museum, Rexal Place, the Citadel and similar institutions. This will be of little comfort to local artists. The AGA wants to get people in the gallery and artists want their work seen but this doesn’t necessarily put the gallery and the artist on the same side. Out of financial necessity, institutions like the AGA are in danger of becoming part of the “rapidly evolving world of commercial museum entertainment attractions” rather than “serious museums”, again, to quote the Washington Post on the most extreme example of this dichotomy, Ted Bundy’s car in the National Museum of Crime & Punishment. If the message of the new AGA is “We’re Open for business!” many local artists see an ominous footnote: don’t call us unless you can help with that business; “profound” might be good, but don’t expect your work to be shown here unless you’re bringing “something box office”. Bio: Blair Brennan has been involved with various art galleries and the local arts community in Edmonton for over twenty years. He has held various board, committee, volunteer and paid staff positions. He has served on a number of arts juries and has curated/facilitated exhibitions of Edmonton artists. Brennan has contributed writing to various Canadian arts and cultural publications (Artichoke, Border Crossings, C -- International Contemporary Art, Cameo, RACAR and Mix) and was recently invited to contribute a piece to Visible Language (vol. 42.1) a journal published by the Rhode Island School of Design. The ‘ACAD All Faculty Exhibition’, which showed at the Illingworth Kerr Gallery for a brief ten days, was an adequate survey of recent work from ACAD’s current instructors. The Illingworth Kerr’s two larger gallery spaces were dominated by 2-D works, with appearances from glass, jewelry, ceramics, sculpture, installation, and various digital and video pieces displayed on flat-screen monitors. While there were several surprises among more traditional pieces, the inclusion of so many artists in this kind of exhibition rarely allows adequate room for works to speak to each other. The pieces that stood out were those of inventive takes on well-known styles and strategies. Fine Arts pieces hung alongside Design, revealing a wide range of painting techniques and skills. Appearances by Richard Edwards, Chris Cran, Jane Kidd, Blake Senini, Aurora Landin, Jeff De Boer, Don Kottmann and Jim Ulrich, to name just a few of the most familiar names, provided many beautiful and stalwart pieces. In contrast were quieter works such as Barbara Milne’s painting ‘Nightshade – Iceland, July’, which focused on deft paint handling and nubby texture, suggesting a closely-cropped mountain in muddy tones and stained brown dots in a powdery stripe of sky. ‘Shun’, a photo etching by Sondra Meszaros, seethed within its figurative confines, eerily combining viewing angles so that it wasn’t clear whether the heavy-set female figure faced outward or turned her back. The liminal textures and tones of the etching held time and place suspended despite a mid-seam which cut the piece bluntly in two. Next to the piece by Meszaros was an inkjet print by Justin Waddell, strangely prefaced by a corny fountain complete with oracle ball spinning in changing colors like a dollar store ‘Lord of the Rings’ garden ornament. The inkjet print, hovering like a desktop screensaver behind the fountain, was of seamlessly blended pinks into peach. The title of the piece, ‘Young Hearts Be Free Tonight, Time Is On Your Side’, words instantly linkable to Rod Stewart’s 1982 radio-ready hit ‘Young Turks’, associates the song’s music video with its choreographed teens running towards a nighttime snog. The flat, insta-sunset colors of the inkjet seemed like a milky sign for mass-packaged nostalgia, while the ugly fountain as front man seemed plunked down as a funny response to anyone looking for a more conventional or personal response from Waddell, who instead provided the stale end-product of such a romantic longing. Tanya Rusnak's three mixed media pieces, ‘Untitled Drawings No. I, II, III (From Series Crystallization and Drift)', appeared as vintage prints and patterns from another age, as they seemed to know intimately the textural and tonal language of antique inks and surfaces. Snowflake patterns in ceramic-white glowed within the deepest of printed blacks. Rubbed corners, edges, and rough lines cut into the sleekness, reminiscent of Bruce Conner's Rorschach works from the 70s and 80s. Mireille Perron's 'Incubator for Conniving Polarities', a vintage doll's refrigerator turned into a diorama, was introduced by the artist's self-proclaimed curatorial premise of 'The Laboratory of Feminist Pataphysics', which Perron describes in a statement as “the reinvention of gendered science through fictive narrative”, often through “social experiments that masquerade as works of art”. The 'Incubator', a diorama seemingly devoted to the art school, features the tiniest of plastic figures who reminisce amongst, for example, a rooftop garden (which Perron calls the 'Garden of Blooming Abnormalities & Anarchic Proliferation'), or an odd glassed-in experiment booth to the left of a cafe (Perron calls this floor the 'Laboratory for Drifting Pollination and Cafe du Jardin'). Precious drawings cover the tiny walls, giving an otherwise heavy use of model-making materials a generous and personal appeal. In the midst of the third floor is a single circular mirror which shrinks and centers the viewer as part of the piece; an inclusion which invites meaning outside of the diorama’s self-contained world. 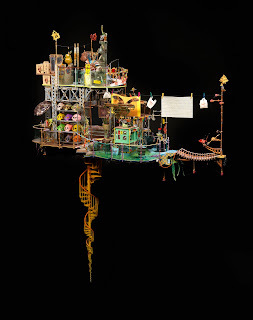 While both the diorama form and the use of dryly funny descriptors for each floor of the ‘Incubator’ add just as many layers of control as inclusion, Perron seems to poke fun at this inevitability in the title of the basement: the 'Bureau of Punctual Self-Administration'. In the center gallery devoted to video and digital works, amidst classic plays on pixilation and ambient sound-works was a piece by Greg Pace which shifted the artist's well-known optical illusions into an unfamiliar digital space. The piece, titled 'Europa', did not give away its construction in quickly digested novelty as was common of many of the surrounding pieces, nor did it fall into the trap of merely resembling a slick website design. At any point in the piece, six vase shapes slid over top of each other in an inventively digital version of a classic reversible image game; the vase shapes lost their definition as fore- and frontal grounds appeared to be projected both atop and behind them. Images of ceramic, tile, paintings and textiles from art history both decorated and took up residence in the vases' facial profiles. Other pieces surprised despite deceptively simple construction, such as Robert Geyer's pink-to-peach glass installation 'Pink Murmur' of tall glass rods in a thick bundle with tops bluntly snapped off in curves, resembling the heads of snakes. Another was Chris Willard's acrylic and polyester latex painting, which, in its stringently gridded circles and lines, responded sarcastically to any easily bored viewer through its title: 'Poppin Fresh, Doh!' When spun, the five steel floor pieces in Katie Ohe’s ‘TYPHOON’ created shapes so strange, their wriggling forms managed to show another side to Ohe’s well-known kinetic work. Hidden on the end of an extra wall in the second gallery was fastened Chris Frey's text, ‘Victory’, a letter of encouragement and reverie to fellow scholars. In the midst of his writing, Frey says "This Canadian mud. It goes on compelling us. So let us get on with the fly-squirm. The delicate balancing of time in/on/and place." I found this line and its visceral images of hatchlings upon the refuse to be an apt piece of advice to end my visit to this exhibition.